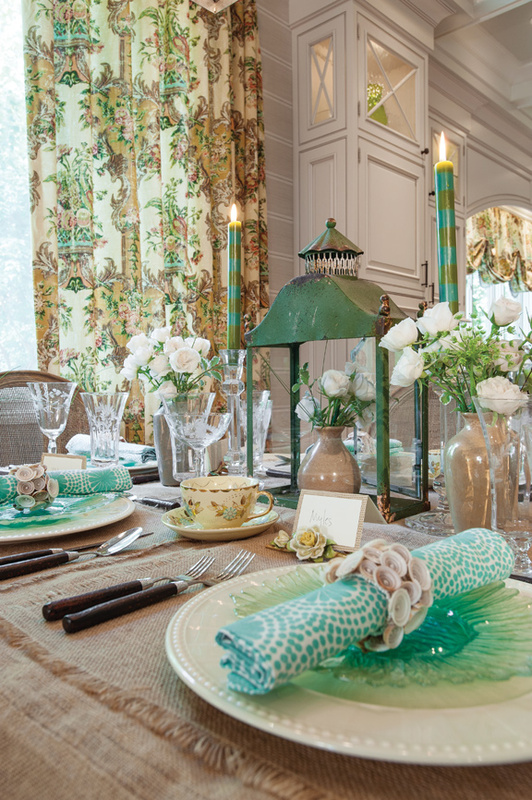 Inspired by nature, designer Megan Clinton encourages clients to express their individuality. 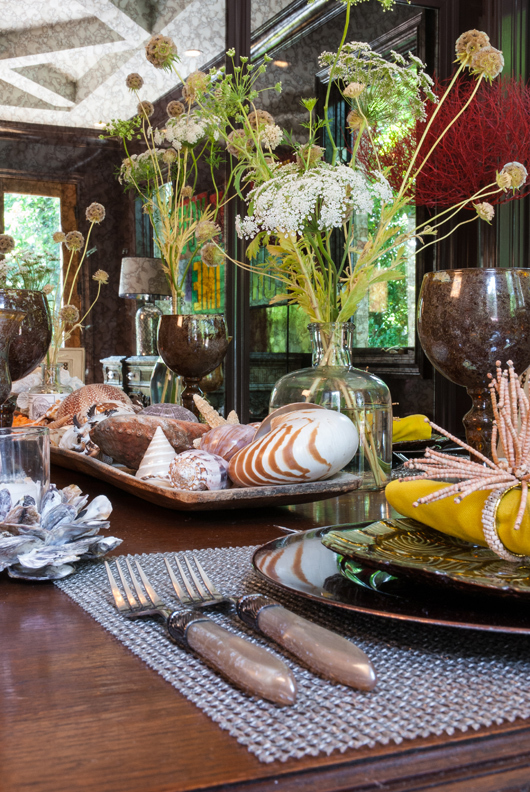 Table settings in the formal dining room emphasize a variety of textures and elements drawn from nature. 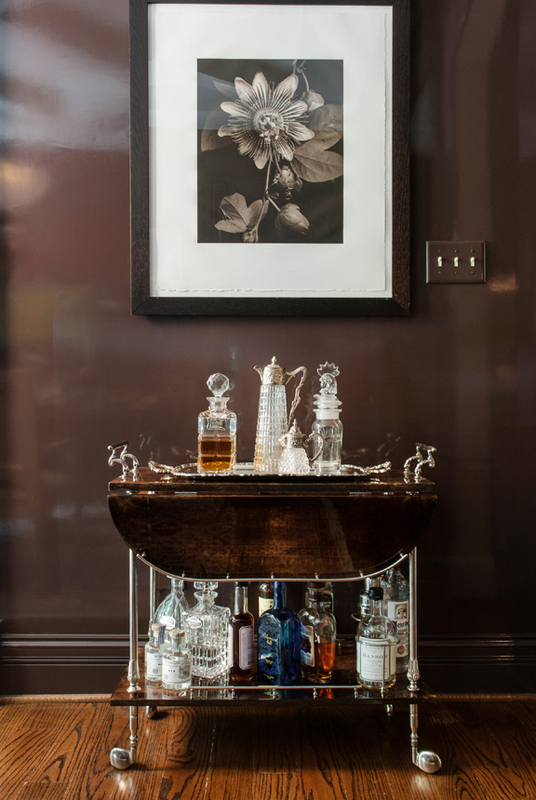 Reflected in the dining room's antique-mirrored wall, an ornate walnut-and-burlwood sideboard is uniquely juxtaposed with an 8-foot steel panel by pop artist David Buckingham. 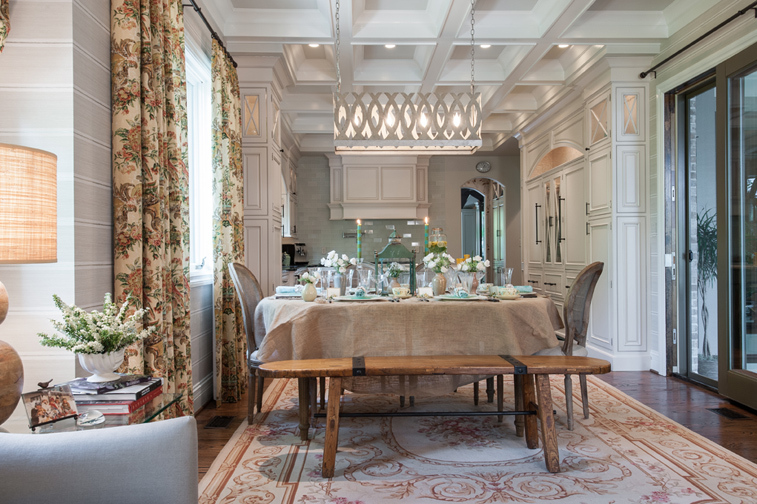 A metal chandelier by Julie Neill Designs, woven-fiber table linens, cane back chairs and a rustic wood bench create a tranquil, "organic" ambience for family meals. 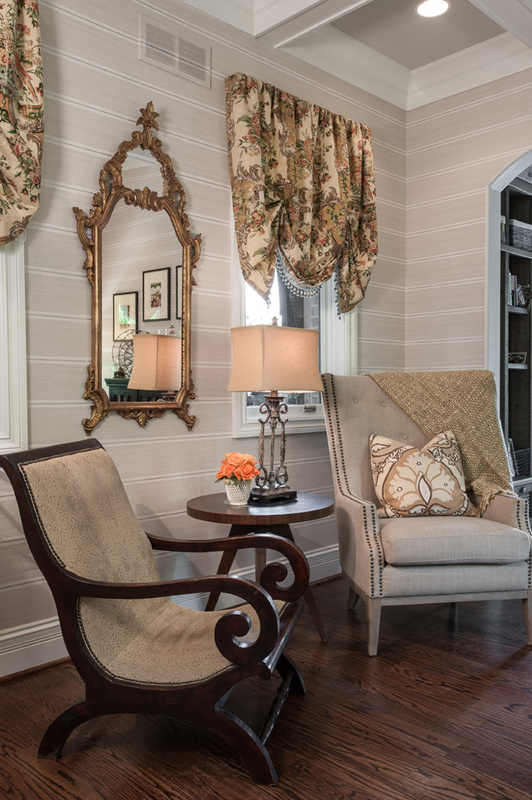 Wallpapered in a horizontal "beadboard" pattern, the sitting area blends a nail head-trimmed wing chair wiht a British Colonial chair in lizard-textured leather, a gilt mirror and a Shaker-style side table. Megan Clinton is many things…a uniquely creative and resourceful designer; a Master Gardener; a devoted wife and mom to three preteen boys; a frequent hostess, known for her “fun bashes”; and quite possibly the least pretentious design professional you’ll ever encounter. 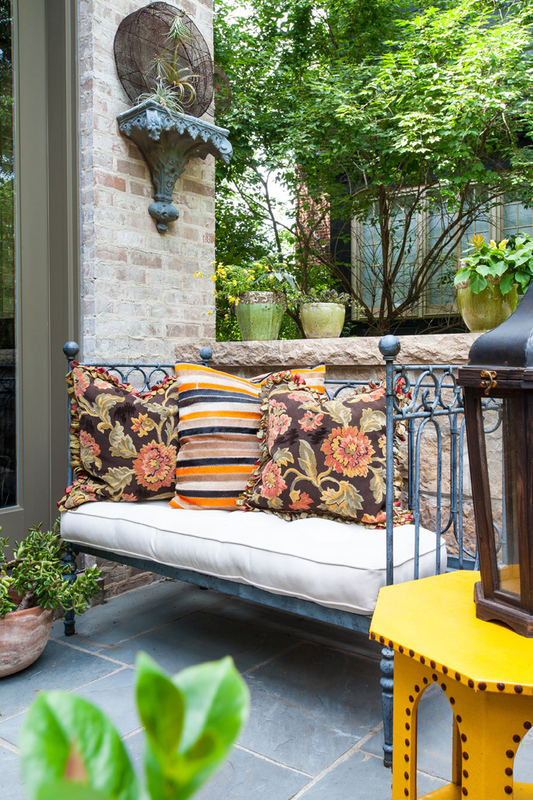 In fact, every plant in this exquisite outdoor space was specifically chosen for its texture and color – an astonishing variety that ranges from false yew, espalier magnolia, wisteria and dwarf oakleaf hydrangea to black mondo grass bordering the courtyard’s crushed gravel surface. Moving indoors, the tour begins in the foyer, which showcases a Gothic-arched entry door, onion-shaped chandelier and an Italian bent glass étagère. 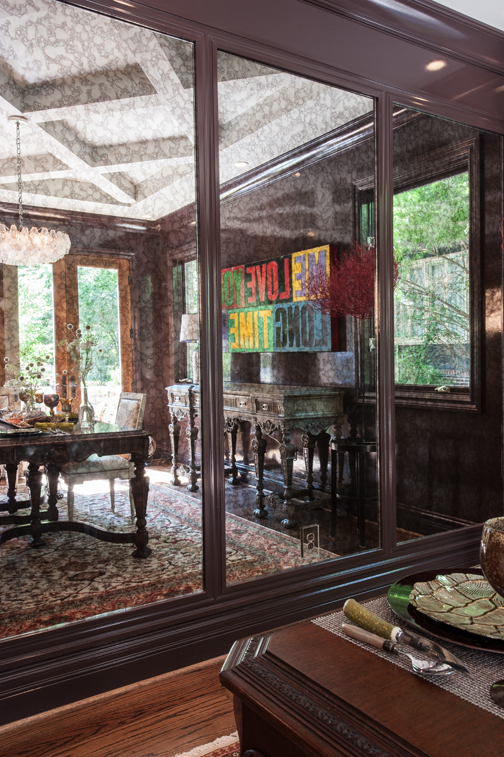 French doors open to the formal dining room where, as in most rooms of the home, each piece has a story. A ‘50s-vintage Venini blown glass chandelier is suspended from the diagonally coffered ceiling. Antiqued mirrors blanket one wall, and the remaining walls are a deep chocolate hue, lacquered for a reflective quality. Purchased at an estate sale, the walnut-and-burlwood sideboard and dining table were originally a matched set, but the sideboard was refinished and glazed for an antique, patinaed look. French-style leather dining chairs from Louis J. Solomon surround the table. 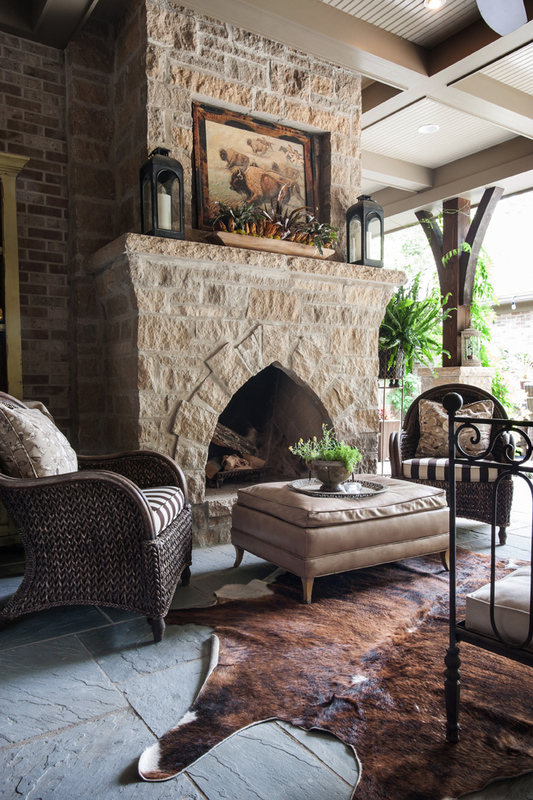 Directly across the foyer, the two-story fireside sitting room is fairly formal, but has a soothing ambience and is used regularly. 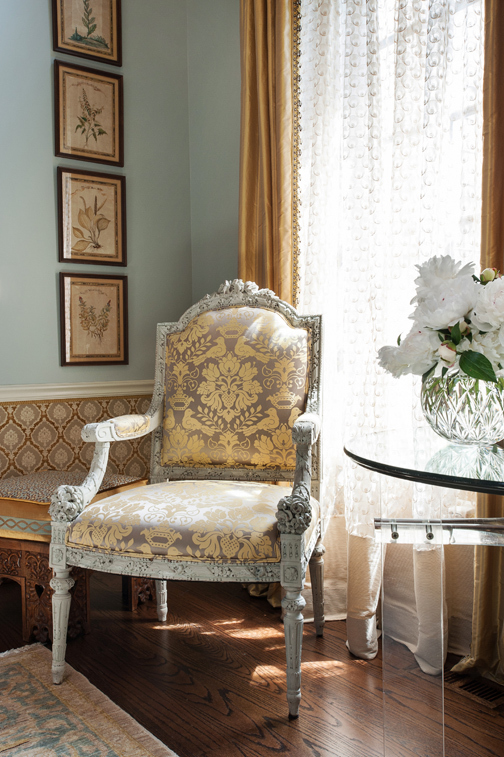 Megan’s objective for the décor was “classic, yet cool,” and she chose a palette of silvery blues with gold overtones and silver highlights, upholstering the walls below the chair rail in a Scalamandre fabric that establishes the color scheme. Proving that “formal” can also be “whimsical,” the space is filled with an intriguing assortment of furnishings, most notably a comfortable chocolate-colored mohair sofa and yak hide footstool, a ceiling medallion from a Chicago cathedral over the fireplace, ginger jars on the mantel, a Shaker rocker in lizard-patterned leather, an acrylic glass-topped table, a Don Wiegand bronze “Madonna” (8th anniversary gift) and a Turkish ottoman. Drapes in a gold silk Schumacher fabric are backed by sheers from the couple’s former home. 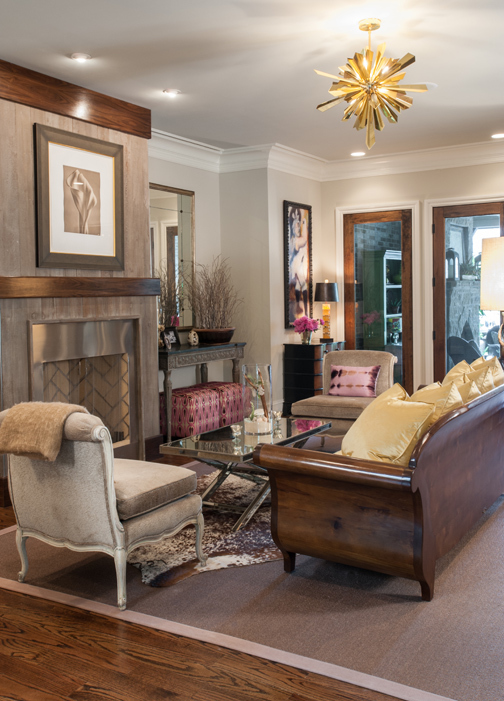 The formal living room overlooks the outdoor hearth room, and Megan notes that her design concept was inspired by the gold starburst chandelier. 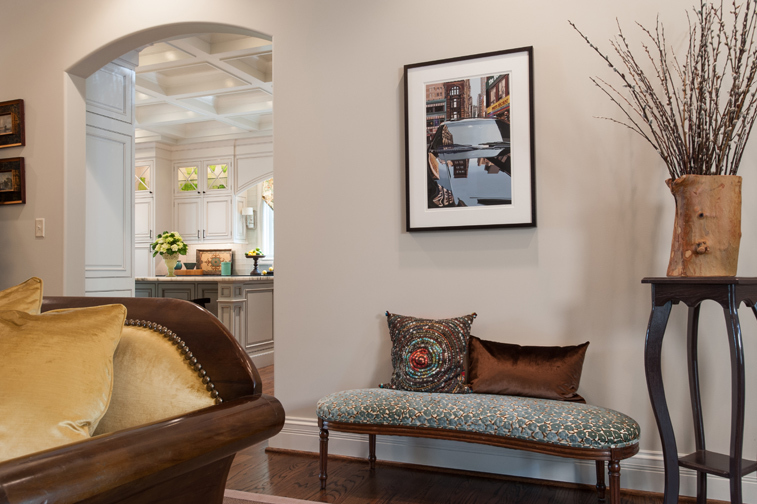 Reupholstered in gold silk velvet, the walnut-backed sofa came from their previous home. The walnut is repeated on the fireplace paneling, which displays “Calla Lily,” a Tom Baril photogravure on paper and Brian’s first-anniversary gift to Megan, who carried a bridal bouquet of calla lilies. Now an investor, Brian was formerly a restaurateur and the kitchen is as much his domain as Megan’s. Fully open to the coffered breakfast/family area, the kitchen features a large island topped with honed marble, soapstone countertops, a glass-tile backsplash in alternating matte/sheen finishes, and custom cabinetry disguising the separate refrigerator and freezer, dishwasher, warming drawer and trash compactor. 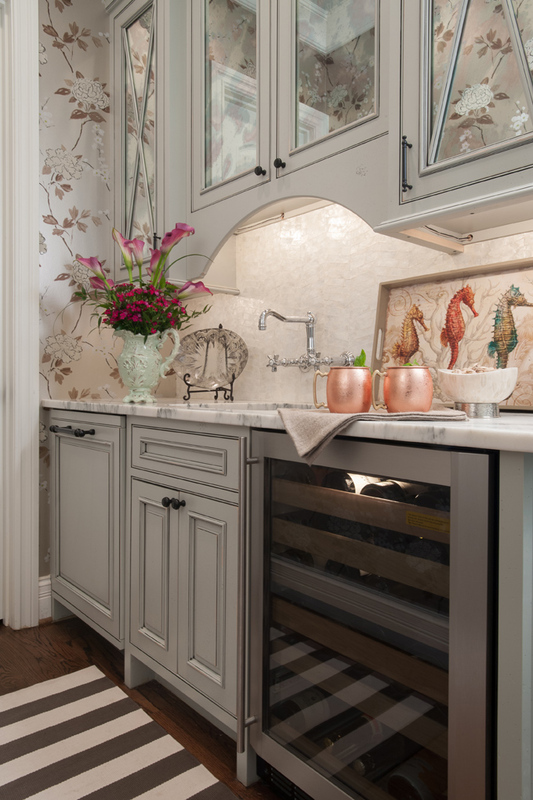 Adjoining the kitchen is a butler’s pantry with a Carrara marble countertop, mother-of-pearl backsplash and cabinets by Robin Bretz, currently co-owner of The Jeweled Cottage, that are backed with iridescent mirrors. Family meals are served in an “organic” environment. Woven-fiber linens blanket the table, which is encircled by cane back chairs, a rustic wood bench and lit by an artistic metal chandelier from Julie Neill Designs in New Orleans. 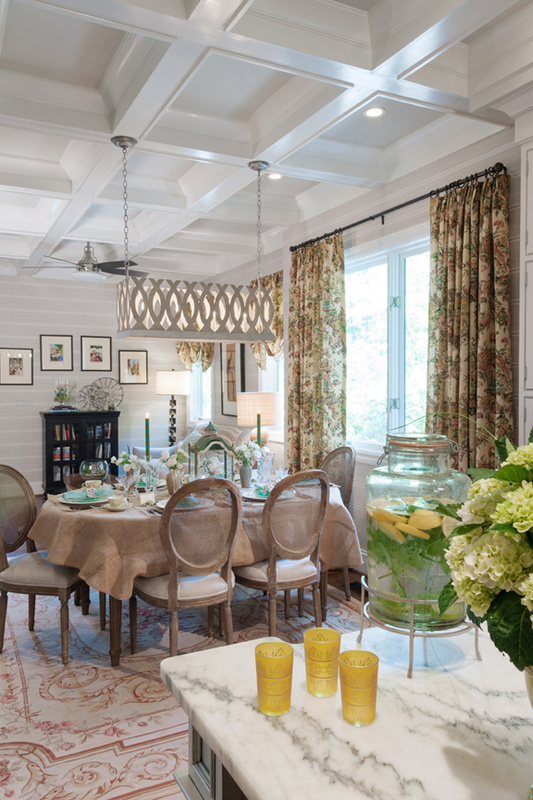 Beyond the dining area is a sun-splashed sitting area, wallpapered in a horizontal “beadboard” pattern and furnished with a linen-upholstered sofa, faux tortoiseshell floor lamp, a wingback chair and a British Colonial leather chair, mirrored walnut side table, and a gilt wall mirror. “It’s the symbiotic relationship of these diverse elements that make the room work,” Megan explains. The tour concludes in the main-floor master suite, which is dominated by a Louis J. Solomon bed in walnut, with nail head-trimmed, ivory-leather head and footboards. Accent pieces include elegant bamboo chairs in a Scalamandre fabric; a ‘70s-vintage mirror in a goatskin-finished frame; a tub chair, inherited from Megan’s mother and reupholstered in a bold stripe and a handsomely carved highboy.